Donald Trump’s former personal lawyer and “fixer” Michael Cohen has been actively working with Robert Mueller’s Special Counsel and has sat down for hours of interviews. ABC News’ Devin Dwyer released a video on Twitter’s Periscope platform in which he spoke with ABC News Chief Anchor George Stephanopoulos about the meetings. He says Cohen has spent multiple sessions and multiple hours covering all aspects of President Trump’s relationship with Russian. “What does that all mean, it means the whole probe into possible collusion between the Trump campaign and the Russians and their interference into the election in 2016. It means looking into President Trump’s financial and business affairs with Russian, and remember Michael Cohen was part of that effort of looking into the possibility of building a Trump Tower in Moscow,” Stephanopoulos explained. 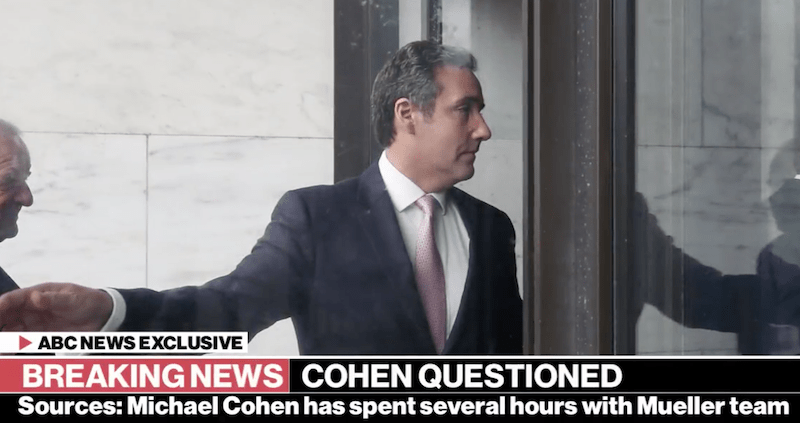 He was also questioned about whether Donald Trump and his allies every considered a pardon with Michael Cohen which would “get into the obstruction of Justice part of the investigation,” Stephanopoulos explained. Shortly after the explosive news was reported ABC News noted that Mueller was working with Trump’s former fixer even though, “Cohen’s participation in the meetings has been voluntary, without any guarantee of leniency from prosecutors, according to several people familiar with the situation. Trump’s former campaign chair Paul Manafort, his campaign deputy chair Rick Gaines, and his former National Security Advisor Michael Flynn are also cooperating with Robert Mueller’s Special Counsel team. You can watch the full Periscope discussion HERE.